Technology and nature, typically thought of as opposites, are coming together in a new London exhibit. The exhibition is aptly named "WILD LIFE." It's located in London's Broadgate and was created by animal conservationists, the Aspinall Foundation, who partnered with a design company called Marokka to create the art. At the center of Finsbury Avenue Square stands a proud, tall gorilla called Gus who is one of the most well known of Marokka's magnificent sculptures. Gus is Marokka's largest sculpture so far at 3 meters tall and their first piece of public art, but he isn't the only Marokka design to see. 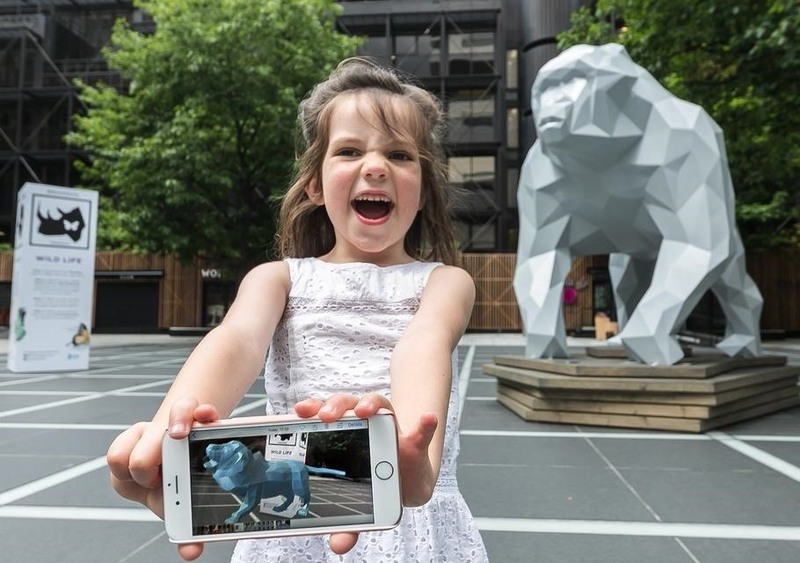 When you download the "Marokka App" while on Broadgate, you can point your smartphone camera at the statue and watch other animal statues come to join Gus, bringing the exhibit to life. From there you can walk around and interact with the giant sculptures. The gorilla is joined by an AR giraffe, elephant, rhino, and lion. In order to fully interact with these creatures, you must walk to their designated spot around Broadgate. There the animals will truly come to life and you will be able to play with them while learning valuable information about them. The company also said that for every Gus sculpture sold, they will donate £10 to the Aspinall Foundation to support their work in protecting wildlife. That is, after all, what the "WILD LIFE" exhibit is meant to do. According to BT, the exhibition is meant to raise awareness for how badly wildlife population preservation needs new technology in order to monitor animals' well being. Technologies that the company is looking for includes trackers and camera traps. The information that is given at the site of each animal, however, also brings awareness to how important it is to protect animals. Gus will stay standing in Broadgate until September 24 of this year and will be featured in the London Design Festival. After that, he will be gifted to the Aspinall Foundation and relocated to a Wild Animal Park in Kent.